Improving Access to Water and Sanitation: Is the Answer Individual Behavioral Change? Born and raised in rural Africa where I spent my youthful life, open defecation was not only the norm but preferred to outhouses that were poorly ventilated and unbearably hot. We did not understand the consequences of exposing human waste around our houses. At that time, the best practice for sanitation and hygiene was to use a hoe to excavate the ground and bury our feces during the farming season so that the food we grew in the wild did not get contaminated. Guinea-worm and bilharzia were common water-related diseases among the children in my village. Our knowledge on water was even poorer. We drank any water we found in the streams and rivers with little understanding that the water source could be contaminated. The few hand-dug wells in the villages at that time were considered to be the best source of potable water because they appeared the cleanest. However, with an entire village relying on a few water sources, the demand for water from these wells was high and sometimes resulted in arguments over who got what water and how much of it. Not surprisingly, the lack of potable water in the villages led to a high prevalence of water related diseases. Guinea-worm and bilharzia were common water-related diseases suffered by most children, especially those of us who swam in rivers and streams. The questions that keep coming into my mind during moments of reflections on my childhood life is, “how did I change from the attitude of open defecation and other WASH related issues?” The answers are not far-fetched. Traditional festivals and funeral events: Since many visitors far and wide came to our village, these events encouraged us to clean our surroundings. Ancestors and gods were also believed to participate in the funerals and festival events. Consequently, it was considered an offense to keep the festival and funeral grounds dirty since the gods and ancestors would also participate in them. We were instructed by the traditional chiefs and landlords to clean our surroundings and make sure that no one defecated in the open, especially around the festival and funeral grounds. Enforcement of clean environmental laws: These environmental laws were enforced by the community sanitary inspectors locally referred to as Samasama. Samasamas were trained sanitary inspectors who went from house to house to assess sanitation and hygiene conditions. Visits from the Samasamas put fear in everyone since households who did not meet the standards of cleanliness were charged fines to deter other households from keeping their surroundings dirty. Provision of potable water sources, latrines and hygiene education. Traditional leaders within our community and external enforcers from government were producing attitudinal and behavioral changes in my life and that of others. Unfortunately, these changes in attitudes and behaviors towards sanitation have not been sustained. Traditional festivals, funeral events, and sanitary enforcement required organization and execution from authorities and government agents within and outside the villages. The traditional chiefs and government officials were respected and obeyed. Moreover, their contributions to village sanitation behavior and attitudinal changes were at no cost to the villages. Unfortunately, these efforts to change village behavior around sanitation no longer exist because new policies and initiatives are being designed for communities without much input from the local authorities. In place of these traditional approaches, today’s programs that develop potable water sources, latrines, and hygiene education, to a large extent, require external financial support and education from hygiene educators either funded by the government or non-governmental development organizations. Their influence and ability to change each village’s sanitation situation are not sustainable because most facilities are donor funded and do not last forever. Today, while some countries in Sub-Saharan Africa such as Ghana considered to have improved potable supply and boasts of 85% water coverage has less than 20% sanitation coverage. A sober reflection on my rural life experience, my academic training in WASH, and 16+ years of WASH working experiences in three different continents, I find it disturbing that many developing countries are still struggling with poor sanitation conditions. My dream as a WASH expert is that every household has access to potable water and improved sanitation and hygiene facilities. This dream, however, seems to be too far from reality because of lack of attitudinal and behavioral changes on the part of individuals and external supports required to stimulate lasting changes in these communities. 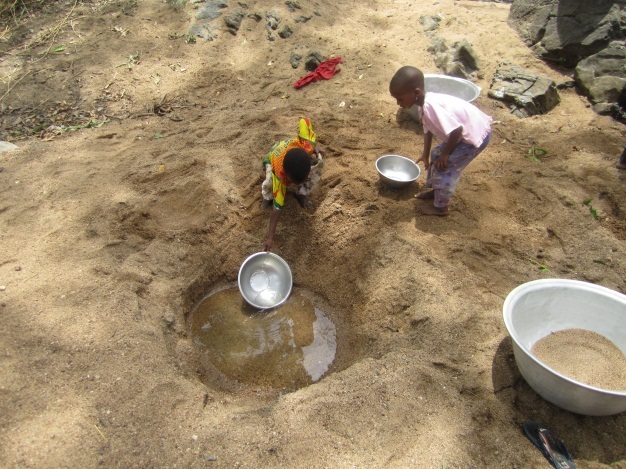 Have wrong policies and implementation strategies made WASH efforts unsustainable? Is it lack of sustained village level education? Are the roles of traditional authorities still encouraged in enforcement of village level sanitation rules like when I was a young boy? Has modernization really improved village-level sanitation? To what extent is sanitation behaviors and attitudes monitored by government health professionals and traditional leaders as it used to be several years ago? What tools and policy instruments are being used to implement sanitation policies? Will the nearly 1 billion people living without clean water and nearly 2.5 billion without sanitation have appropriate answers to the questions above in their lifetime? Working closely with communities on a sustained basis may provide the synergy to fight water and sanitation problems among the 1 billion and 2.5 billion people without water and sanitation facilities. However, in order to supply sustainable solutions, WASH stakeholders should stop prescribing predetermined solutions and instead customize WASH solutions at the community level that fit with each area’s customs, beliefs, and behaviors. Thank you for your interest in the story and re-posting it. I am interested in blogging on the various websites you suggested. Any conditions or laid down procedures on blogging that you might want me to know?